"Empress of Asia is an epic story of love and war by Adam Lewis Schroeder, a young talent hailed as "the next great Canadian writer" (Books in Canada). "The year is 1942 and the world is engulfed by war. Young Canadian seaman Harry Winslow has just arrived in Singapore after the bombing of his ship, the Empress of Asia. One night in the ravaged city, while under attack from the enemy, Harry meets and falls madly in love with a vivacious young Englishwoman named Lily. After a hasty marriage, they are separated during the confusion of an air raid. Harry begins a desperate search for Lily, which takes him across Southeast Asia. He endures hunger, illness and unimaginable cruelty before finally being re-united with his wife. "Many years later, in Canada, Harry sits at Lily's bedside. In her dying moments, Lily hands him a scrap of paper on which she has scrawled the address of Michel Ney, a man who saved Harry's life before being killed by the Japanese during the war, but who Harry believes his wife has never met. Lily has revealed an astonishing secret: could she be in contact with a man she never knew, and why does she insist on Harry's reunion with him now? Harry journeys to Thailand, piecing together the events of past years. What secret has lain between Michel and Lily and how can Harry prepare himself to accept it? "Fifty years after the wartime events that changed his life forever, Harry begins the final adventure of his life-to retrace the journey of his Empress of Asia and to uncover the mystery that lies at the heart of the love of his life. "A powerful story peopled with unforgettable characters, Empress of Asia is a stirring chronicle of love and loss, of loyalty and betrayal, amidst the turbulence of war." 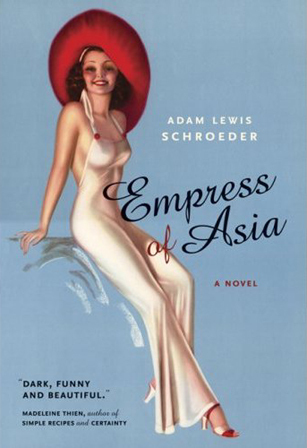 "Empress of Asia is an ambitious and stunning new novel from Adam Lewis Schroeder. Schroeder has painted a beautiful and compelling story of youthful innocence and determined love against a setting of the horrors of the World War II POW camps in Southeast Asia. Cover design by Teresa Bubela. Original pinup calendar art, "Woman in a White Dress," by Billy de Vorss. His wife Glenna served as the model in the majority of his pieces; de Vorss met her in 1933 while working as a bank teller in St. Joseph, Missouri. The cover is not meant to depict Lily Winslow specifically, but even so I think it's awesome that this is the artist's wife. "Canadian Seaman Harry Winslow lands in war-ravaged Singapore when his ship the Empress of Asia is bombed by Japanese aircraft. He meets--and falls in love with--Lily, a genteel Daughter of the Empire. They recklessly marry, and just as quickly are separated. Young Harry spends much of the novel-when he isn't fending off starvation, tropical maladies, cruel prison guards and other disasters of war-searching for his beloved Lily. "Schroeder is a master of voice, and Empress is laden with richly drawn characters. The intelligence and affection with which he presents Lily and Harry will leave you eager to follow them through some of the worst events of war, across Southeast Asia, and back to Harry's home in Canada. "Adam Lewis Schroeder's first book, the short story collection Kingdom of Monkeys, was universally acclaimed: the Globe and Mail said "the textures and scents and colours of Indonesia, the Philippines, even 19th-century Singapore, shimmer on the page," and the Seattle Times exclaimed that "Schroeder makes an astonishingly assured debut … [his] prose is subtle, spare, almost elfin in the precision with which it alights on giveaeway moments and unconscious desires." "Empress of Asia lives up to the promise of that collection, and is the long-awaited next book from this assured and intelligent young writer. Enjoy!" The materials in the Author's Notes have been prepared so that interested readers of Empress of Asia can learn how places I visited, people I spoke with, records I listened to or books that I read led to the novel being written. The Notes might also answer your questions regarding the writing process in general, assuming you had some. Even if you have not read Empress of Asia -- perhaps have not even heard of it -- but the above descriptions have piqued your interest, the Author's Notes will provide a preview of the novel without giving too much plot away. See the links below.